C1 Inhibitor antigen. 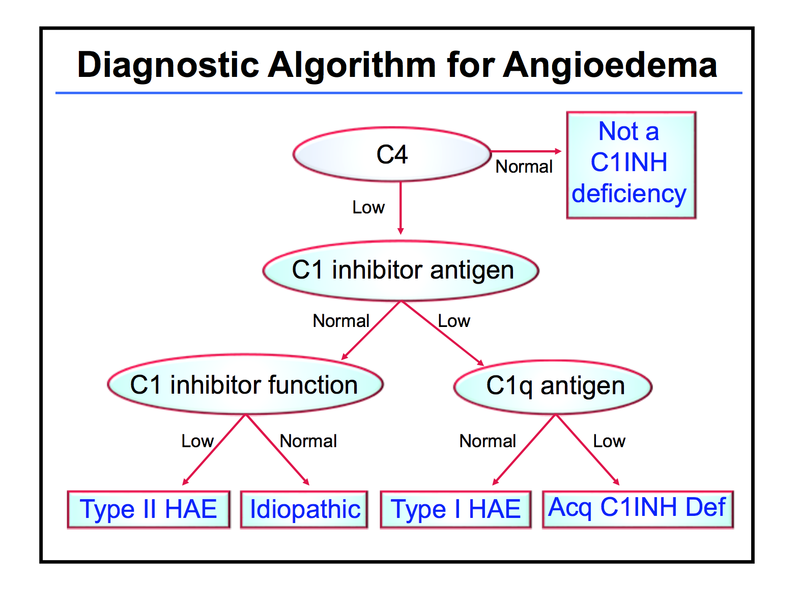 If low C1 inhibitor antigen, check, C1q Antigen. If normal C1 inhibitor antigen, check C1 Inhibitor function by Chromogenic assay (100 % sensitivity). 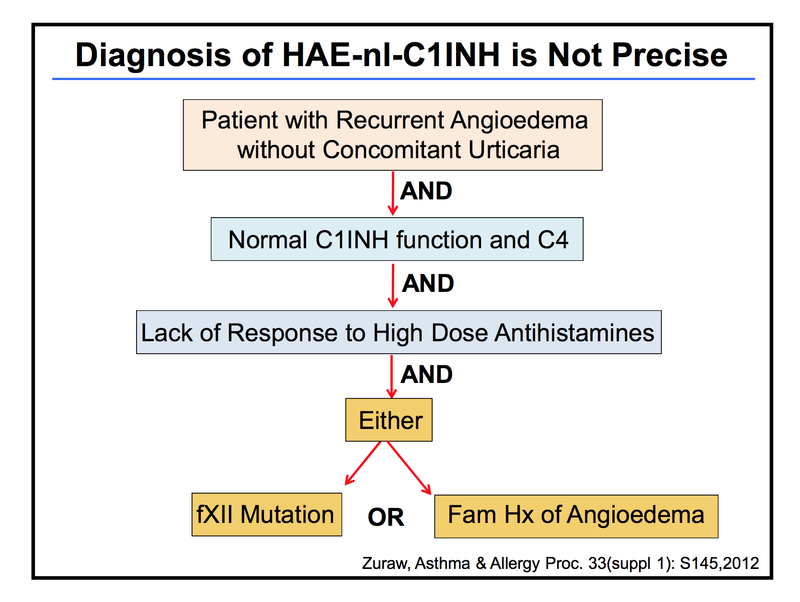 If all normal, check fXII mutation. Glucocorticoids do not inhibit mast cell degranulation but probably act by suppressing a variety of contributing inflammatory mechanisms. Illustrates how C1 Inhibitor absence can cause increased production of BK by 4 different effect. If normal, functional assay is done. Chromogenic assay (100 % sensitivity). Hence, is a better test. Stress, Infection, Estrogen, ACEI all can trigger HAE flare. Progesterone does not trigger or exacerbate it. Hence, avoid OCP containing estrogen. 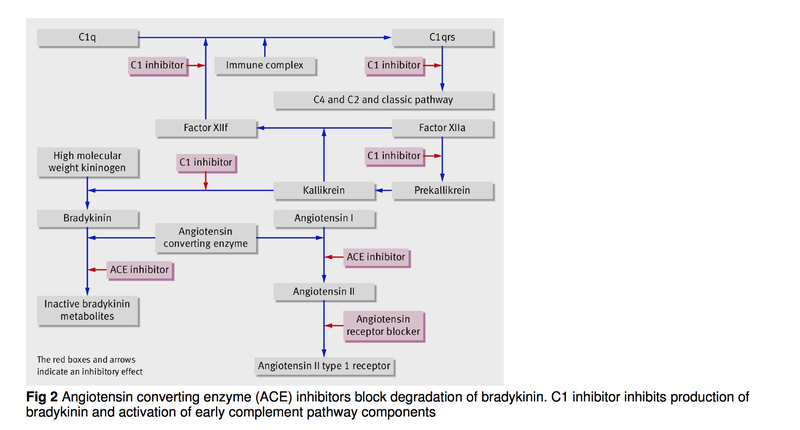 All of these triggers increase Bradykinin production. Emotional Stress: Not clear how it causes worsening of the symptoms. Prophylactic medication may decrease facial swelling, but does not reduce the laryngeal attacks. Hence, acute treatment strategy should be ready. No preferred drugs for acute or prophylactic treatment except for children or pregnant patients. There is a variation in the frequency of tongue swelling as well. 65 yo F presents with recurrent symptoms of skin lesion, and throat discomfort. No syncope, airway compromise, or anaphylaxis. No prurutis. She has diffi culty in swallowing. Patient has not had this in the past. No family history is present. Is taking Lisinopril for 15 yrs. Patient has not had any fever, lymphadenopathy, or joint pain. No prior history of abdominal pain or cramps as well. Her mother also has had SLE. These lesions are equally painful as well. Hgb, WBC, Plt is normal. ESR is normal at 15. CRP is slightly increased 1.7 . Albumin is 4. UA with microscopy was not done. Following were the clinical findings. C4 is low. What is the diagnosis? Urticaria is characterized by raised, erythematous, and extremely pruritic lesion. They typically appear in one area, and resolve over the course of several hours, and then reappear elsewhere. Individual lesion may enlarge, and develop central pallor before fading. 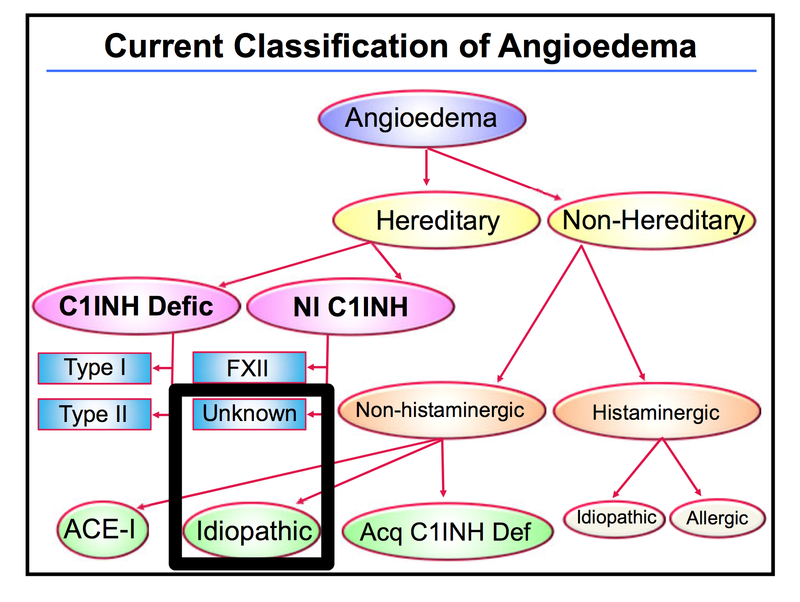 What is the difference between Angioedema and Urticaria pathophysiologically?